To renew your registration, first search for your vehicle. 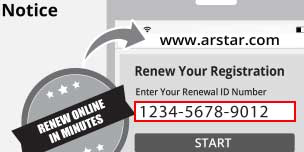 Your Renewal ID Number can be found on your Renewal Notice, as seen below. What if I don't have my renewal reminder? When renewing I received one of the following messages. What do they mean? You are not eligible to renew online and will have to visit or contact your local Revenue Office. Where would I find my VIN? In most vehicles the VIN is located on the dashboard or on your vehicle registration document. Do I have to have valid liability insurance, current year assessment and personal property taxes paid for the current year? Yes, before renewing your vehicle license plate, you are required by Arkansas Law to maintain liability insurance, assess your vehicle with your county assessor and pay all personal property taxes you owe.